OXFORD, Miss. 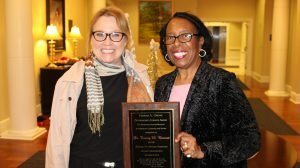 – The School of Applied Sciences at the University of Mississippi has named Tracey Barnett, of Ripley, as the Thomas A. Crowe Alumnus of the Year for her outstanding contributions in the field of social work. Barnett is an assistant professor in the School of Social Work in the J. William Fulbright College of Arts and Sciences at the University of Arkansas. She began her tenure-track career at the University of Arkansas at Little Rock in 2015. In her young career, she has already been selected as the Ronald E. McNair Mentor of the Year and taught research and technology, evaluation research and social welfare policy. Her research interests include food insecurity and evidence-based nutrition education, specifically the Share Our Strength Cooking Matters program’s impact on diet quality and food security for recipients of the supplemental nutrition assistance program. Her research expertise is program development, implementation and evaluation. “I examine differences among participants by race, gender and cardiovascular health outcomes, and long-term health impact of these findings on society and the economy,” Barnett said. Barnett earned her Bachelor of Social Work from UM in 2008, her master’s degree from the University of Alabama in 2011, and her doctorate from the University of Texas at Arlington in 2015. A 2005 graduate of Ripley High School, Barnett transferred to Ole Miss after attending Northeast Mississippi Community College. She credits her mother, Starlette Vance, and sister, Dr. Freda Barnett Braddock, for their endless support and reaching out to the Department of Social Work to learn more about the transfer process, job opportunities in social work and scholarship opportunities. After receiving glowing recommendations about Barnett for her rich campus involvement in the community college setting, the department also hired her on as a student worker. “One day, my mom called the social work department and spoke with Dr. Carol Minor Boyd, then chair of the social work department, and Dr. Debra Moore, then director of field education,” Barnett said. “They told my mom that I should apply for the Luckyday scholarship for transfer students. I applied and received this scholarship. Barnett credits the department and its faculty for not only helping her get to Ole Miss, but for taking her to national professional conferences, where she met scholars as passionate about the field as she was. The faculty provided sound advice and resources she needed to transition to graduate school and navigate a doctoral program. “The trips, conferences, grants, well-known scholars, the array of experiences they exposed me to – I later learned that many of my other colleagues from my graduate and doctoral program had yet to receive the same level of exposure,” Barnett said. “A few (UM social work faculty) provided letters of reference for my graduate school applications. “Also, I remember them always sharing real-life stories from their social work practice experiences in their class lectures that made the course material more applicable. Susan Allen, professor of social work, taught Barnett while she was pursuing her bachelor’s degree. As a scholar herself, Barnett regularly reaches out to UM social work faculty for advice and research collaboration. “Throughout my tenure-track career, they have always made themselves available to impart wisdom and give me advice on important career moves,” Barnett said. Allen is looking forward to the research that will stem from Barnett’s work with Tess Leffman, assistant professor of social work, advancing knowledge and interventions related to poverty, nutrition and brain development for children in Arkansas and Mississippi. “Her outstanding knowledge of children and community well-being will also be beneficial in work with Dr. Saijun Zhang, as they look at improving family and children’s outcomes,” Allen said. 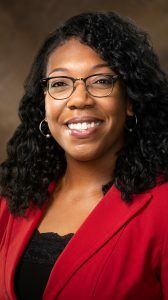 “Because of her commitment to the improvement of health and health behaviors in the African-American populations of Mississippi and Arkansas, her collaboration with Dr. Desiree Stepteau-Watson in their joint work with African-American families can impact well-being outcomes in the two-state area. To follow the excitement of receiving the Thomas A. Crowe Alumnus of the Year Award in December, Barnett is celebrating her New Year’s engagement to Stephen McElwee and is planning her wedding for spring 2019. The School of Applied Sciences calls for Thomas A. Crowe Alumnus of the Year Award nominations from alumni, faculty, staff and students each fall to be submitted via personal letter of recommendation. A selection committee comprised of administrators, Alumni Board members and faculty review letters submitted for each nominee and make a recommendation to the dean of applied sciences. The dean approves and announces the selection at the school’s winter holiday gathering, where the alumnus is formally recognized. For more information about the Department of Social Work, visit http://sw.olemiss.edu/ or call 662-915-7336. For more information about nominating next year’s Alumnus of the Year, call the dean’s office at 662-915-7900.